Like most Tom Petty fans, I went into shock on October 2, when I heard of his sudden death. My painting of Tom Petty amidst wildflowers was hanging in a restaurant in Fort Collins, Colorado at the time, and at the particular moment I heard of his passing, I stood in front of it. I had brought my cousin who was visiting from Chicago to the restaurant to see this and my other paintings on display. As I was telling her how and why I painted this Tom Petty portrait, my phone started dinging with text messages from friends and family telling me the sad news. Both of us stood staring into those blue eyes, feeling the irony of looking at someone's picture as we heard the news of his death. After recovering from this bizarre experience, and still feeling despair over losing someone whose music I listen to daily, I decided to create a few products using my images. Mugs, t-shirts and luggage tags are the result, and I am humbled that many have sold this year as fans want to keep the impact that Tom Petty and the Heartbreakers had on their lives front and center. I get personal notes of how Tom Petty affected lives, and how devastated my customers were to hear of his death. These notes especially mean a lot to me as I feel that fans of anyone they admire bond together in unique and "creative" ways. Late last year, I heard Tom Petty's announcement that he and the Heartbreakers would tour for the band's 40th anniversary in 2017. I sat down around Christmas and painted an image of Tom Petty in black ink. I was stoked. He and the Heartbreakers would be performing at Red Rocks in late May, and that was a concert I didn't want to miss. I drew a funky black and white of Tom Petty because of his out-of-the-box, unique way of living life as independent artist. You can buy this print, or this print matted and framed on my Etsy shop. At the beginning of May, I found myself housebound and off my feet with a kidney stone, and so I started doodling to pass the time. I was worried I would miss the concert, so I did some positive imaging to get myself better. 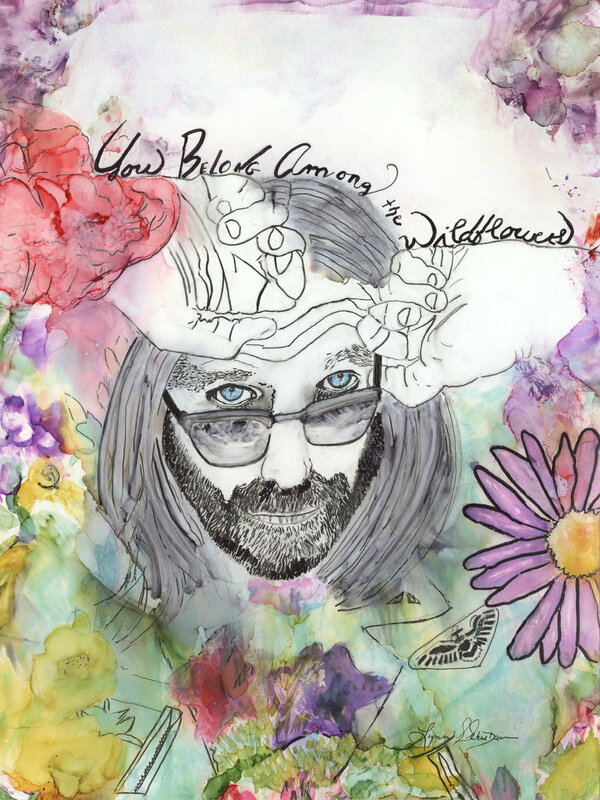 These doodles became another Tom Petty portrait— in this case using alcohol inks and the title of "You Belong Among the Wildflowers." I eagerly anticipated the concert over Memorial Day weekend, because I had last seen the Heartbreakers in 1980 during the "Damn the Torpedoes" tour. Many years later, I was an even bigger fan, because I loved Tom Petty's independence and funky, free-spirited attitude he maintained for 40 years. He was legendary in my book of creative greats. His piano player, Benmont Tench, is also one of my favorite musicians. I made it to Red Rocks, and the concert went beyond what I could have imagined. It is the only time I ever sat in the front row for any concert, and it was well worth it. It is now seared into my mind's "greatest experiences ever" database. And then the news came in October of his death. But I still listen to Tom Petty and the Heartbreakers every day in my studio, in my car, and as I cook dinner. He will always inspire me. Thanks for reading my blog, and thanks for all your support in 2017. And thanks to Tom Petty and the Heartbreakers for 40 years of songs that inspire me every day and through every era of my life. Check out Tom Petty prints and products available on my Etsy shop. For all Tom Petty fans out there, these are great remembrances of a rock hero whose music became the soundtrack to our lives. Also to view the original Tom Petty Wildflowers painting custom matted and framed, visit Schwebach Arts. As artists, we enter everything. We try to get into juried shows. We try to get into galleries. We try to sell our artwork online. We try it all in an attempt to get our art and our message out into the world. So when someone contacts YOU, someone tells you that the painting she found on your blog/website is what they need for their upcoming book, you get excited. Okay you get up and dance around the room while your dog looks at you as if you've popped, and you scream so loud that your eyes water—and pop right out of your head. That's what happened when Thames and Hudson, Australia e-mailed me one day about including my quirky "cockatoo" ink painting in their upcoming publication titled, "Cockatoo." 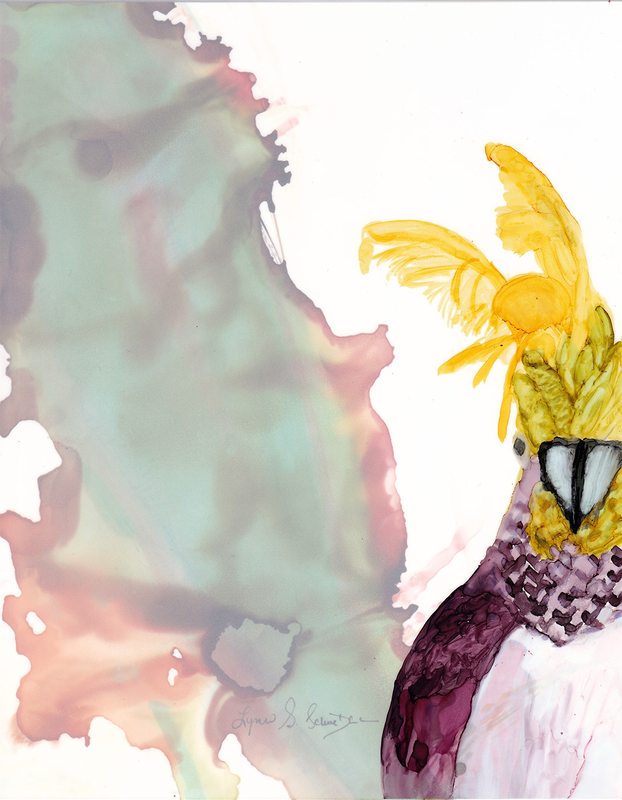 Along with 80 other outstanding illustrations/painting, my cockatoo painting "On the Shoulder" appears. I am honored. Check out the book "Cockatoo" on the publisher's website. I am selling the original painting, matted and framed, on schwebacharts.com. Check it out here. I am also selling prints on my Etsy site. As with most of everything that happens to me these days, I cannot find the words to express how I feel about getting included in this art book. WOW doesn't quite do it, but it's all I have at this moment. WOW! My mom painting in a Memories in the Making Class. Me and my mom enjoying a Memories in the Making Class. This is a photo I took in Australia available on the Shop Photos" page. All photos are copyrighted. Through art, I strive to describe emotions that words cannot approach. I believe that some emotional states have yet to be named, because they are too powerful for words. And what about the space between opposing emotions? I often find myself in this abstract, nebulous place. Through my paintings and photography, I create a walkway into a transcendent place where easily defined emotions don't apply. Doors that open through my art were either closed, or impossible to open in other ways, or even doors that I did not know existed. Some doors were shut a long time ago and are slowly being reopened. I often use organic images of the natural world as a way to open and get through these doors. Or I use vibrating colors or abstraction to perceive of a reality that differs from what our finite senses tell us. My paintings often combine realism and abstraction. New doors often arrive through the viewfinder of my camera. I might be far from my home, sitting in a coffee shop among foreigners, pondering life over coffee, and I connect with something in someone's gaze. Or I could be home in Colorado capturing the beauty of a lighted mountaintop at daybreak. Or perhaps I'm back on Chicago's South Side, trying to understand the complex, diverse, and often dangerous neighborhoods where I grew up. Sometimes I reproduce images as a photograph. Sometimes I print the image and paint it. Sometimes I do both. Sometimes I combine photographs and paintings. Creating for me always translates into finding and opening new doors, trying something new, searching for ways to break new ground. I value the freedom to experiment and to find novel ways of expression. Experimenting with expression is what brings me the greatest joy as an artist—although I don't think joy is the most accurate symbol for this feeling—it's simply the word that most closely approximates the intense emotion one senses while creating. Perhaps "contemplative" is the best word, for now, to describe my paintings and photographs. I thank you for looking and reading. Please contact me if you have any questions regarding my art. I also run at Etsy shop at www.schwebacharts.etsy.com.